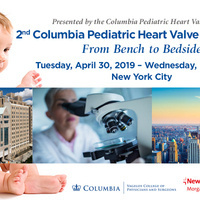 The 2nd Columbia Pediatric Heart Valve Symposium: From Bench to Bedside is the Second Annual Cardiovascular Therapy Course focusing on medical and surgical management of congenital heart valve disease, hosted by NewYork-Presbyterian/Columbia University Irving Medical Center. This program represents a unique multidisciplinary collaboration between congenital and pediatric cardiac surgeons, adult congenital cardiologists, pediatric cardiologists, pediatric interventional cardiologists, and heart valve scientists, allowing for a truly comprehensive approach to the management of children and adults with congenital heart valve malformations. This one and a half-day course will further educate on the surgical and interventional management of patients with congenital heart valve malformations. Lectures will be given by internationally recognized experts who will review standard and emerging treatments for patients with congenital heart valve malformations, address the newest and most innovative therapies and review clinical, basic science and translational research programs, exploring edge-cutting and disruptive concepts to develop new valve devices. Such collaboration will ultimately improve care in children and adults with congenital heart valve malformations, thanks to a constant dialogue and works from bench to bed and back from bed to bench. Didactic sessions, case presentations and interactive discussions will engender learning and improvement in the management of patients with the full spectrum of congenital heart valve malformations.